Welcome back to Part II on the five reasons I don’t recommend going vegetarian. Reasons number one and two were included in Part I and can be found here. So let’s get right back into it. But whole grains are good for me, right? Well, not exactly. There’s nothing in whole grains that you can’t get more efficiently from other food sources. No one dies from not eating grains. Traditionally, cultures that used grains were very careful in their preparation. They soaked, sprouted and fermented their grains to make them more digestible. This also makes them more nutritious. Today, very few companies do this as it’s a time intensive method. Improperly prepared grains are hard on our digestion. Gluten in particular, which is the main protein in wheat, barley and rye, is wreaking havoc in our culture right now. Furthermore, most grains are a government subsidized cash crop and the food industry needs grains, especially refined ones to make their bewildering array of food like products. And remember, grains, especially the refined ones, are high in starch which is essentially chains of glucose molecules and thus…sugar. Food for thought: Grains are fed to cattle in factory farms to fatten them up. Could the same dynamic be occurring in the US population? Because the standard American diet is so rooted in grains, American vegetarians often eat tons of them. Cereals, breads, pasta, muffins, bagels, rice and sweets become standard American vegetarian fare. This can set the stage for digestive problems, malabsorption, fatigue and a whole host of connected health problems. So what to do if you’re a vegetarian? Cut back on grains by incorporating more soups and stews which are wonderful for digestion. Choose rice and quinoa over wheat products as they are more digestible. Choose eggs over cereal for breakfast. If you have chronic digestive issues, consider giving up all grains for a short time and see if it makes you feel better. If that sounds overwhelming, start by giving up gluten for two weeks. Many vegetarians eat a lot of soy products for their protein. I sure did when I was a vegetarian. Soy dogs, soy burgers, soy ice cream, soy milk, soy this and soy that. Just go to your local health food store and you’ll be astounded by all the ways the soy industry can morph a completely tasteless bean into so many different products. Seriously, have you tried plain tofu lately? Blech! I think I’d rather eat dirt. If tofu is so healthy then why is it so bland? Our taste buds used to serve as our guide. The more flavor, the more nutrition. And then there’s the countless processed foods full of artificial flavors that trick our taste buds into craving them. Because soy is so tasteless the soy industry has to add all sorts of spices, flavorings, chemicals and fillers to come up with their products and then market them as a health food. These are not real foods! And soy presents its own set of health problems. For starters the majority of soy products don’t resemble anything that was traditionally used in Asia. No Asian culture ever ate soy dogs. Or god forbid, Fakin’ Bacon. They were eating fermented soy. Fermented soy has health benefits. The fermentation process releases some of the anti-nutrients in soy and makes it more digestible. Miso, natto and tempeh are fermented soybean foods. Soy sauce traditionally also came from fermented soybeans. Nor were these foods eaten in large quantities. About 10 grams per day in the average Asian diet. And unfermented soy can cause digestive problems. Soy is one of the top food allergens in America. The soybean is also a known goitrogen which can impair thyroid function. Soy also contains phytoestrogens which mimic estrogen in the body and can cause hormonal shifts, in particular, estrogen dominance. Estrogen is the hormone that promotes growth in the uterine lining during a woman’s menstrual cycle. Too much estrogen can lead to cysts, fibroids and cancer. Estrogen dominance is a major problem in the industrialized world as many chemicals and pollutants mimic estrogen in the body. Of course, birth control and hormone replacement therapy are a huge part of the problem as well. Ironically, soy has been marketed as a food for healthy hormone balance due to some favorable studies. But guess who funded those studies? What to do if you’re a vegetarian? Choose fermented soy products over unfermented soy products. Eat them in small amounts. Stop drinking soy milk. It’s often full of sugar as well. Book recommendation: The Whole Soy Story by Kaayla Daniels. #5 Vegetarianism is not native to most climates in America and thus does not support local food systems. Local is all the rage in the food movement and for good reason. It’s more sustainable. Contrary to popular belief, animal-based agriculture is a huge and important part of that. Most vegetarians believe all animal-based agriculture is environmentally destructive. This stems from the widespread practice of factory farming which is unquestionably horrific in every regard. But the traditional way of raising animals, which allows them to graze, pasture and eat their natural diet is actually vital for the sustainability of local food systems. Animals play essential roles in building topsoil by grazing, roaming and defecating. Without animals on farms, fossil fuel-based fertilizers are needed. Organic or not, they’re not sustainable. Most of us have become so distanced from raising food that we are completely unaware of the cycles of Nature that are inherent in raising healthy food. And we forget or just don’t know that animals are necessary to the integrity of local food systems. I see so many Americans (especially here in western Massachusetts) who are highly influenced by the spiritual teachings of India and become vegetarian for spiritual purposes. Though health reasons were my initial impetus for going vegetarian, a meditation practice became further fuel for my vegetarian beliefs. While I deeply respect anyone’s choice to go vegetarian, sometimes I think we forget that many spiritual/religious belief systems evolved in a specific climate and geography. Food rites and rituals tied to seasonal availability of food are deeply embedded in those belief systems. Vegetarianism is not something that would’ve been possible in the Swiss Alps. Or a coastal culture dependent on the sea. Or Native Americans on the Great Plains. Or most places on this planet. So it is interesting to note that because vegetarianism is not native to America, it is mostly a byproduct of industrialization. Few areas in America support the year round production of fruits and vegetables. You must ship these in from places like California, Florida, Mexico and other warm weather regions such as Central and South America. Now granted you can also be an omnivore and eat foods that are supported by the industrialized food chain. Most do out of convenience and cost. But my point is that most American vegetarians believe vegetarianism automatically promotes environmental sustainability. Few are aware that their dietary choices can support more rampant over farming and more environmental problems than those who choose sustainable grown animal products. Most health food stores are stocked with vegetarian foods that were made in factories from soy, GMO canola, sugar and conventionally grown grains. All of these are grown in ways that damage the environment and then shipped over thousands of miles. Shop and buy local as much as possible. 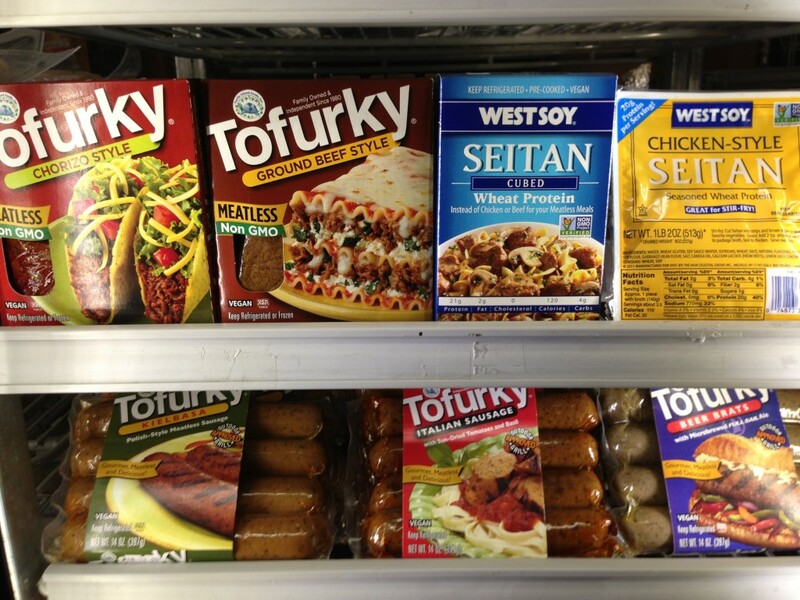 Stop buying processed vegetarian foods like processed soy products and pre-prepared canned meals. Note: I HATE the title of this book and believe it prevents vegetarians from reading it. A better title would be The Agricultural Myth, which is what I believe this book is really about. It’s a great read for anyone, vegetarian or not. So there you have it, five reasons I don’t recommend going vegetarian. If you are a vegetarian and don’t feel well, I hope you learned something and will consider some of these points. If you’re a vegetarian and feel good, you’re probably already aware of most of these points. Keep up the good work! Thoughts? Feel free to share in the comments.